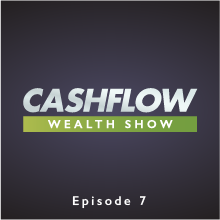 This weeks episode of the Cash Flow Wealth Show features Blair Singer, corporate sales trainer and Rich Dad advisor. Blair’s goal in this episode is simple, to identify the key components you need to have if you’re going to boost your income in the next year. Blair identifies the secret enemy that’s blocking your income, how you succeed as an entrepreneur, what every great business needs, and the importance of a Code of Honor. Kim Kiyosaki, co-founder of the Rich Dad Company, is our guest today, discussing the struggles she faced creating her company with husband Robert. But, once Kim realized that nobody was going to come rescue her, she did 2 things that helped her overcome her situation and start succeeding. Kim talks about the key things in growing your business, including not being able to get there on your own and needing a team. She discusses the idea of precession and the importance of always having goals, always striving to better yourself (and your business). This week’s presenter is RallyMe’s founder Bill Kerig. Bill shows the behind-the-scenes view of starting up a business. He discusses what it took to succeed, what traditional business advice you can throw out a window, and what you have to keep in mind in order to succeed. RallyMe was created by Bill in order to help sports individuals and teams raise money to have the sporting experience they desire. His proof of concept was none other than sending winter Olympic athletes to Sochi. Once they proved they could do 1 athlete they ended up helping 27 other Olympic athletes who ended up winning 5 medals for Team USA. Pat Donohoe joins Ben Miller from FundRise to discuss how to include crowfunding in your real estate portfolio. Ben discusses how his company allows smaller investors get involved in many different projects to still get 12%+ returns. Ben and Pat discuss how FundRise differs from REITs, how they structure their investments to protect their investors as much as possible, and where the entire idea came from.